Building the topline and overall muscle development in the horse can be a real challenge for many horse owners. In order to provide for proper topline and muscle development in the horse, protein and amino acids are vital for success. Most feed regimens and forages being fed are lower in digestible protein and not often high enough to support proper muscle growth. Supplementing with Cur-OST EQ Topline & Muscle, may provide the edge you are seeking to help your horse to rebuild muscle and topline. These three elements were discussed in more detail in another article on the topline in the horse. One of the most critical elements is nutrition and with that, highly digestible and balanced protein to aid in muscle development and recovery in the horse, which includes the topline. Provides over 20 grams of highly-digestible plant based pea protein with supplemental amino acids at critical doses, along with Co-Enzyme Q10 and Lipoic Acid to support muscle development, strength, overall cellular function, digestive health, and cellular energy production. Results In Just a Matter of Two Weeks! 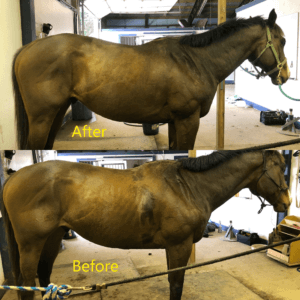 When added to a proper nutrition program, along with exercise to stimulate the topline muscles in the horse, results and improvement in muscle condition can be seen in just a matter of a few weeks. 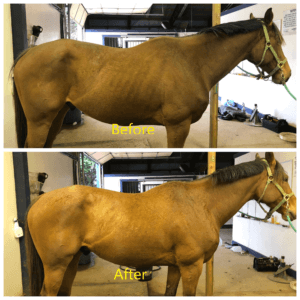 These two Thoroughbred geldings were placed on an alfalfa/orchard grass diet, supplemented with Cur-OST EQ Topline & Muscle daily, and exercised 3-days per week for 16 days. The improvement in the topline, shoulder, and overall muscle development in the rear quarters is quite notable. This is just after a little over 2-weeks! Building a topline in your horse shouldn’t be a struggle! 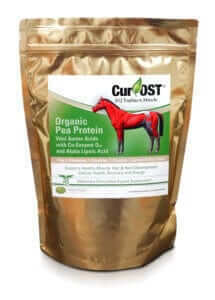 Cur-OST EQ Topline & Muscle helps to provide the additional protein and amino acids that your horse requires to promote proper muscle and topline development. It is a part of our daily program here, with rehabilitation horses. Make it a part of your horse’s regimen!